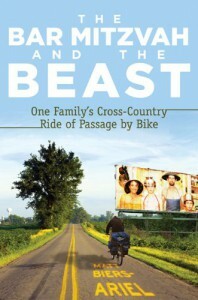 I really liked this true story of a bike ride across America. The writer is a progressive, religious Jew whose older son is an atheist who doesn't want to have a Bar Mitzvah. But the dad wants him to have some kind of meaningful rite of passage, so he tells his son Yonah that he can either have a Bar Mitzvah, go on a trip to Israel, or ride his bike from coast to coast with Dad. Yonah doesn't really want to do any of those things, but he picks the bike ride as the least distasteful. Yonah decides to use the trip to draw attention to climate change and to get thousands of people to sign a petition. Then little brother decides that he wants to come on this trip too. He's eight years old! How can he ride 3,800 miles? On the back of a tandem bike with Dad, that's how. Mom decides to come too because she's not letting these clowns out alone, plus she likes to bike ride. You would think these people are incredibly fit bike fanatics to take on this crazy mission. They're not. The dad was a very funny and sympathetic narrator, but I was right with Yonah the whole time. He wasn't having any of his dad's religious beliefs or Zionist claptrap. I was a Hebrew School drop-out too, and I sided with Yonah during the many light and humorous conversations about religion. I am a sucker for books about people traveling across country (like Blue Highways by William Least Heat Moon or A Walk Across America by Peter Jenkins) so this one was right up my street. I loved the description of the scenery and the colorful characters that they met, and the many ways their bikes kept breaking down. The author had a lot of pre-conceived ideas about people, and it was fun to see his world being opened up. I didn't agree with all of the writer's musings along the way (particularly that prejudices are impossible to extinguish) but I enjoyed reading them. The whole family was very sweet, and the younger son Solomon was especially funny. The mom, Djina, was like the voice of reason. What was hilarious was that even though this journey seemed like an amazing, life-altering experience, Yonah found it just as boring and senseless as many kids find their Bar and Bat Mitzvahs. It was inspiring to read about people who take climate change really seriously. And it made me want to spend more time outdoors and get on my bike. 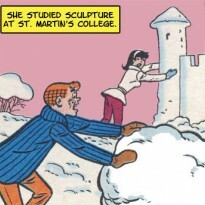 Although maybe not across the desert in the middle of summer. Finally, the book design was great. I particularly liked the little bicycle icons that rolled across the bottoms of the pages that ended the chapters. I received this ARC in a Goodreads giveaway.